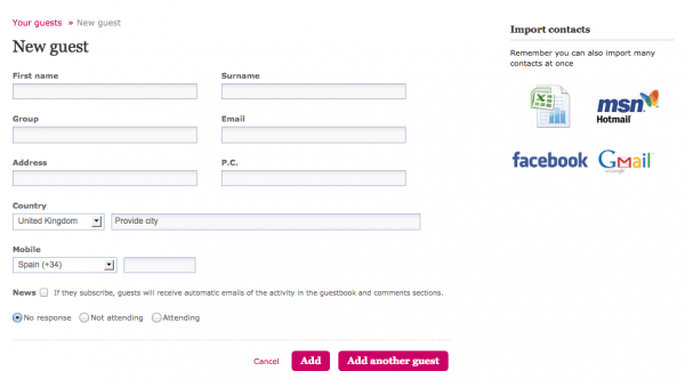 Looking to organise your guest list and send out your wedding invitations? If so, look no further. The Zankyou wedding website service can make life easier for you by helping you gather your guests' details with our quick and easy-to-use guest list management tools. Making your guests feel like part of your wedding is important. You might have 300 or you might have 30, but whatever the length of your guest list, you want them all to be informed of what’s going on. There are plenty of ways to keep your guests up-to-date with your wedding planning. Here at Zankyou, we think having a wedding website where guests can check up loads of different things about your big day is a great resource. However, while we’re all online and our wedding smartphone apps are buzzing nowadays, it’s also true that lots of couples still like sending their wedding invitations and information by post. One of the biggest hassles of doing this is getting hold of your guests’ addresses. A group email feels impersonal; individual emails take ages and raiding your mother’s address book is not an option as she’s 150 miles away! Don’t worry, your Zankyou wedding website is here to help you! 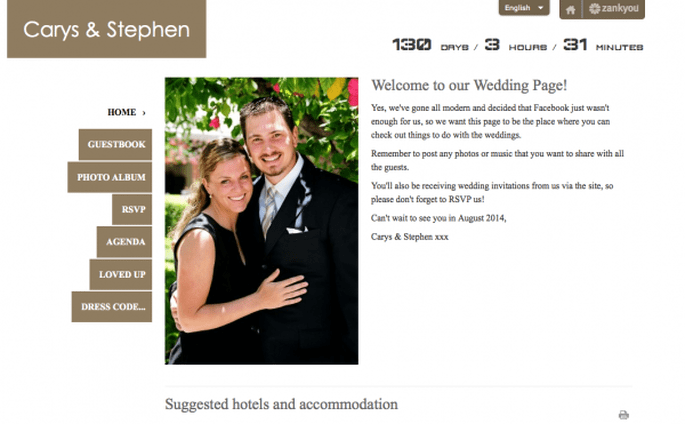 Part of the wedding website’s free service is the option to manage your guest list online. Like any online service worth its salt, you can do lots of things you would normally do on paper and in person electronically via the site, including setting up your guest list, sending invitations and receiving RSVPs directly via the site. Once you start adding guests to your guest list, you will then be able to communicate with them, sending them messages directly from your wedding website to their email accounts that they, then, will be able to answer via the site. You can also include your Zankyou wedding website address on your paper invitations, so that guests can check out the site once they actually receive the invitations. This is especially handy for logistical issues (and saves you printing out loads of maps) and for your online gift list, should you choose to use the Zankyou cash wedding gift list service. As you can see from the menu above, you can send Save the Dates to your guests and even arrange your table plan once you have all your guests on the list. But as far as this post is concerned, we’d like to draw your attention to the Request address option – which allows you to send a message to your guest asking them for their address. This service respects your guests’ privacy, by only allowing them to see the message you have sent to them and never the details of other receivers (kind of like a BCC), even if you’ve actually programmed a group message. Also, their information is protected on your Zankyou site and only registered owners of each wedding website (that is, you and your other half) can view guest list information. Furthermore, for your and their peace of mind, if you want an extra layer of security, just password protect your whole site when you set it up, so only you and the people you choose to give the password too will be able to access any of the info you put online. So, with your Zankyou wedding website, not only can you actually set up your guest list online, but if you still want to send postal invitations, you can actually manage the logistics of sending them out via Zankyou and then register the RSVPs on your guest list. Zankyou’s aim is to make life easier for couples and we think this is one of the biggest ways we can help you with your wedding planning. What do you think? For more information, check out our wedding website demos NOW!